Healthcare facilities have an essential role to play in addressing climate change through mitigation and adaptation strategies. The healthcare industry accounts for 10% of the total carbon dioxide emissions in the United States showing there is work to be done in decreasing emissions that contribute to climate change. Additionally, in each healthcare facility, a climate adaptation and resilience plan needs to be developed in order to identify vulnerability to climate threats and to ensure continued operations during extreme weather events. Educate on climate change and health: Hold lunch and learns or continuing education for health providers. Incorporate climate change health impacts in patient education materials, such as brochures, fact sheets, plan of care and discharge instructions. Include climate change in environmental health patient assessments. Volunteer or apply for positions that can shape the culture of the organization such as the the hospital supply purchasing committee or Chief Sustainability Officer. Promote energy efficiency: Nurses can work within institutions to reduce the use of fossil fuels by promoting energy efficiency in operations and building design, along with encouraging the use of clean energy when possible. Simple acts such as shutting down non-essential electronics in patient-care areas and turning the lights off in supply rooms, utility rooms, and meeting rooms when not in use need to become part of the culture of the organization. Streamline waste disposal practices: Nurses can advocate for processes that reduce waste by encouraging recycling, reducing improper disposal of hazardous waste, and capture and recycling of anesthetics gases. Encourage green transportation: Nurses can encourage colleagues to utilize public transportation, carpooling, bicycling, or walking to work to reduce fossil fuel intensive modes of transportation. Promote sustainable foods: Hospitals can utilize purchasing power to purchase healthy and environmentally sustainable foods to serve to staff and patients to promote health and reduce their carbon footprint. Reducing amount of meat served and buying sustainable meats protects produced without the use of routine antibiotics. Buy local and seasonal foods when possible to serve in cafeterias. Building climate resilience: Nurses can assist with development of climate adaptations plan for hospitals and other healthcare facilities. Perform climate risks and community vulnerability assessments to identify potential climate threats on facility operations and use to inform resilience plans. Plan for impacts from extreme weather by incorporating factors into building design and identify potential risks from aging infrastructure. Ensure plan in place to maintain operations of critical clinical services and shelter in times of extreme weather events. Dr. Beth Schenk leads efforts for environmental stewardship and is the sustainability coordinator at St. Patrick Hospital in Montana. She has worked with ministries across the system to reduce environmental impacts for the past 10 years. She co-leads ACES (Action Collaborative for Environmental Stewardship) across Providence St. Joseph. 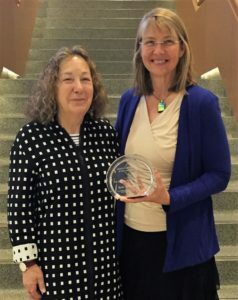 In her academic work, she developed the “Nurses Environmental Awareness Tool” which has been used in multiple states and several countries to assess awareness of the environmental impacts of hospital-based healthcare. She was named the 2017 Charlotte Brody Award Winner for her work in creating a healthier environment in healthcare. Health Care Without Harm is an international organization working to promote environmental sustainability in the healthcare sector. Practice Greenhealth is the source for environmental solutions for the healthcare sector and lends support to create better, safer, greener workplaces and communities. Global Green and Healthy Hospital’s Network is an international network of hospitals, health care facilities, health systems, and health organizations dedicated to reducing their environmental footprint and promoting public and environmental health. EPA Energy Star for Healthcare Financial Analysis Calculators help organizations calculate the financial impact of improved energy performance. Catholic Health Association’s report: Climate Change and Health: Is there a role for the Health Sector? 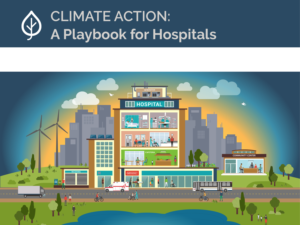 Climate Action: A Playbook for Hospitals is an interactive tool intended to inspire and engage hospitals to engage in climate action and provides resources and information on how to implement solutions in facilities.